$195. Vintage mid-century modern Murano glass lamp, c. 1960. 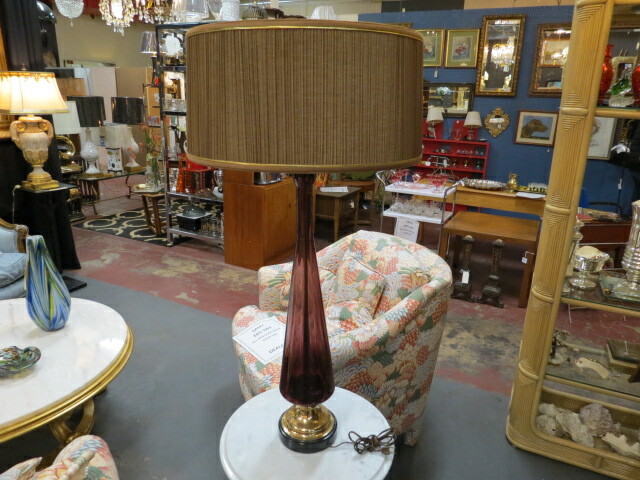 Hand blown purple glass lamp tapered to the top. Sits on a brass and black wood base. Pleated brown drum shade with gold trim. Perfect for your living room. Excellent condition. Shade measures 18in round 9in tall; base of lamp is 8.5in. Entire lamp with shade is 38in tall.